Now, your phone is your Card! About --> Device --> Android version. If this doesn't work on your device, plase contact your phone manufacturer. What is Emirates NBD Pay? Emirates NBD Pay, is a mobile contactless payment solution that enables customers to make in-store purchases with their mobile devices. Emirates NBD Pay works on Near Field Communication (NFC) enabled Android devices with operating system KitKat 4.4 and above. Only Emirates NBD Debit & Credit Cards can be used with Emirates NBD Pay. Within Emirates NBD Pay what is Near Field Communication? Near Field Communication (NFC) refers to the technology which uses radio frequency to provide a secure wireless connection between an NFC enabled card / device and an NFC enabled payment terminal. Instead of inserting or swiping a card, payments can be made by placing the contactless Card or phone near the contactless payment terminal at stores. To enable Emirates NBD Pay, how do I know if my Android device has NFC? All Android devices with KitKat 4.4 and above are NFC enabled. You can additionally check for the NFC tab under your phone's Settings Menu. Who can use Emirates NBD Pay? All Emirates NBD Debit and Credit Card holders using NFC-enabled Android KitKat 4.4 and above devices can use Emirates NBD Pay. How do I know the version of operating system on my Android phone? Go to Settings --> About --> Device --> Android version. If this doesn't work on your device, plase contact your phone manufacturer. Do I need to upgrade my Android operating system to use Emirates NBD Pay? Yes, to use Emirates NBD Pay you need to upgrade the operating system on your mobile device to Android KitKat 4.4 and above. How does Emirates NBD Pay work? Emirates NBD Pay is available on the Emirates NBD Mobile Banking app. Emirates NBD Cardholders with NFC-enabled Android mobile devices on KitKat 4.4 and above will need to download / update their app from the Play Store and then register their Credit and Debit Cards into Emirates NBD Pay. Once registered, they can simply hold their mobile device over the contactless terminals at merchant locations to complete transactions below AED 300. In some merchants / locations, for payments above AED 300, as an additional level of security, customers will be prompted to enter their PIN. How can I add my Debit / Credit Card into Emirates NBD Pay? Enter the Mobile Banking User ID and password, answer secret questions and enter Authentication Code sent as SMS to your registered mobile number. Why am I being asked to answer secret questions to verify my card in order to enable Emirates NBD Pay? This is an additional security step to ensure that the request is placed only by yourself and is a one-time activity to enroll your Cards. Simply answer the secret questions and enter the 5 digit Authentication Code sent to your registered mobile number to complete the enrollment. How can I delete my Debit / Credit Card from Emirates NBD Pay? What is the Preferred Card? What is the Virtual Card Number? When you enroll your Debit or Credit Card for Emirates NBD Pay, a Virtual Card number is issued for each card. This is a unique alternative 16-digit-number which will be used instead of the number on your physical card to make payments more secure. In Emirates NBD Pay transactions, the transaction slip will show only the Virtual Card number. Why is my Emirates NBD Pay receipt showing a different last 4 digits compared to my card numbers? The last 4 digits shown on the transaction slip refer to the Virtual Card number. This is a unique alternative 16-digit-number which will be used instead of the number on your physical card to make payments more secure. In Emirates NBD Pay transactions, the transaction slip will show only the Virtual Card number. If the merchant would like to verify the validity of the card, please tap on Emirates NBD Pay from the home screen of the Mobile Banking app. You can then scroll through the list of cards to the card being used for the transaction. You will find the last 4 digits of the physical card as well as the last 4 digits of the Virtual Card number on the card image, which can be presented to the merchant as an additional security measure. Where can I use Emirates NBD Pay? 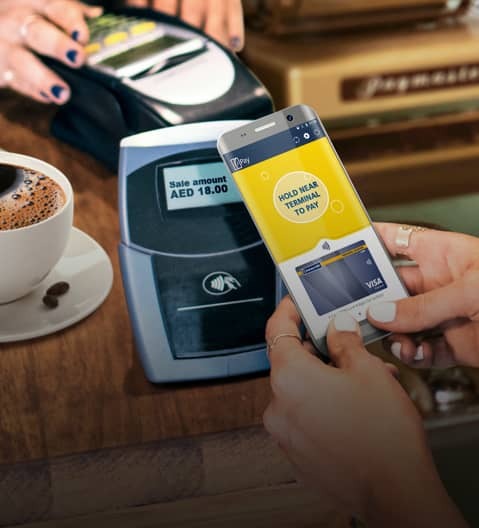 Emirates NBD Pay transactions can be made at any NFC-enabled contactless payment terminals. Simply look for the sign at your favorite stores. Is Emirates NBD Pay safe? Emirates NBD Pay is a secure payment technology. A Virtual Card number is issued for every enrolled card. This replaces the physical card number for Emirates NBD Pay transactions and hence the merchant is not exposed to the physical card number. For transactions above AED 300, customers are required to enter their PIN as an additional security measure. Will I still earn rewards and benefits on my card when I pay with Emirates NBD Pay? You will get all the benefits, rewards and protection that your Debit or Credit Card currently provides when you pay with Emirates NBD Pay. I am unable to add/use my card on Emirates NBD Pay. What should I do? Please pay with your physical card and contact Emirates NBD at +971 600 54 0000 for further assistance. Are there any charges for Emirates NBD Pay? Emirates NBD Pay is currently free of charges. However, charges from your mobile carrier may apply depending on your data plan. How will I know a transaction was successful when I pay with Emirates NBD Pay? After completing a payment using Emirates NBD Pay, payment confirmation will be displayed on your mobile screen. Additionally, you will continue to receive transaction alerts through SMS on your registered mobile number. Will I be able to see a history of my transactions made with Emirates NBD Pay? Yes, you will be able to see all transactions through the respective card statement in the Mobile Banking app. Can I use Emirates NBD Pay to buy things online? No. Emirates NBD pay is currently only available for contactless transactions at physical stores. Can I continue to use Emirates NBD Pay if my physical Credit / Debit card is due to expire? You can continue to use Emirates NBD Pay till your card expiry date. If you do not activate your renewed card, you will not be able to use it for Emirates NBD Pay transactions. Once activated, it will be automatically updated in Emirates NBD Pay. Can I continue using Emirates NBD Pay if my physical Debit / Credit Card has been replaced? If your old card has been blocked when you placed a request for replacement, you will not be able to use Emirates NBD Pay till you enroll your new card. Do I need to be connected to Wi-Fi or my cellular data network to use Emirates NBD Pay? You would need an internet connection to enroll cards / disable cards from Emirates NBD Pay and to check card available balance / limit. To make Emirates NBD Pay transactions, you do not need to have a cellular data network or Wi-Fi. All you need to do is to ensure that the NFC option on your phone is switched on. Please note that Emirates NBD Pay may require you to periodically login to the app and connect to the internet with your device. What happens with Emirates NBD Pay if I lose my phone? If your phone is lost or stolen, call Emirates NBD on +971 600 54 0000. We will immediately disable your enrolled cards from Emirates NBD Pay. You can then continue to use your physical card and enroll your cards on another device. Will all merchants accept Emirates NBD Pay? Emirates NBD Pay can be used at all merchants which accept contactless payments. Simply look for the sign at your favorite stores. As not all merchants have adopted this technology yet, you may need to carry your physical cards as well. If I disable all my cards from Emirates NBD Pay, does that cancel my physical cards or can I continue to use them? Deleting cards from Emirates NBD Pay will have no effect on your physical cards. You can continue to use your physical cards as you normally would. You can add your credit and debit cards back into Emirates NBD Pay at any time. What happens with Emirates NBD Pay if my physical credit/debit card is temporarily blocked or suspended? Your Emirates NBD Pay transaction will be declined if your card is blocked or suspended. Can I use Emirates NBD Pay if my physical credit/debit card is lost or stolen? If your card is lost or stolen, please call Emirates NBD immediately on +971 600 54 0000 to report the same so we can block the card and replace it. This will ensure that there are no unauthorized transactions on your card. After we block your card you will not be able to use Emirates NBD Pay. Please remember that you will remain liable for all transactions on your card until the time of reporting the loss to the bank. Please refer to the terms and conditions of card use on our website. My wife has a supplementary card. Can I enroll her card in Emirates NBD Pay on her mobile? Yes, you can. If she has an NFC enabled Android device with KitKat 4.4 and above, you can log into Mobile Banking from her mobile and enroll her Supplementary Card on her device. Once enrolled, she can use her mobile to make payments with her supplementary card. However, she will not be able to check the available limit / balance on her card or add/ delete any card, unless she logs into Mobile Banking with your User ID and password. Can I configure Emirates NBD Pay on multiple devices? Yes, you can configure and use Emirates NBD Pay on multiple devices. You will need to log into Mobile Banking on each device with your User ID and password.